Nigeria greeted me with a lot of check-posts. They were simple palm-thatched shacks, of a type more commonly seen with plantain or yams being sold beneath them than places for showing my passport and vaccination certificates. Were it not for the wooden posts spiked with large nails lying across the road I might have thought twice about stopping. There were no signs, no power, and no-one at any of these dozens of check-posts (containing immigration, customs, police, army, or health officers) was wearing a uniform. Few people have anything positive to say when you tell them you’re going to Nigeria. “Good luck.” “Be careful.” “You’re mad”. For the past several months I’ve been hearing such comments from both Africans and non-Africans. On this basis I should have been nervous about entering Africa’s most populous country. Perhaps if it had been a French colony I would have been. Dealing with bribe-hungry hopefuls at check-posts is a lot harder in a language you can’t speak fluently. The truth however is I’ve been looking forward to seeing just how Nigeria lives up to its reputation. Could it really be as bad as all those scare stories about scams and crime the Ghanians told me? The check-posts have fortunately decreased in number the further I’ve journeyed into the country. A more common sight has been the derelict petrol stations. 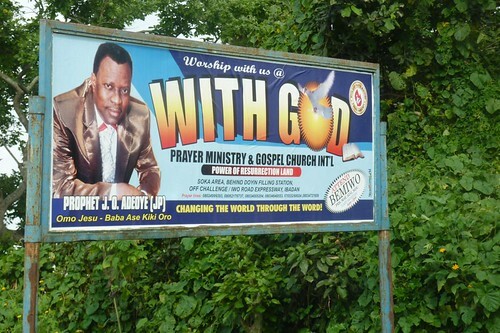 With their over-grown grass fore-courts and rusted signs there must be hundreds if not thousands of these in Nigeria. Oil is a dirty business in more ways than one. The back-bone of the country’s economy is also the reason for many of its problems. Nigerians still have some cause to be happy though. Petrol costs about £0.30 a litre in stations which sell it. 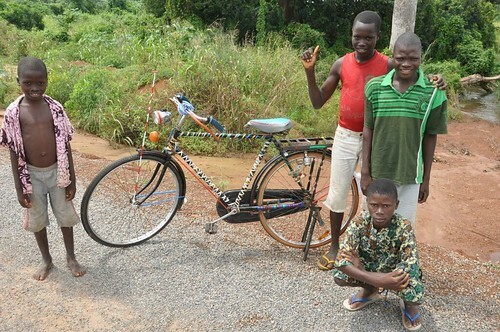 Perhaps that partly explains why no-one rides bicycles, at least in Ogun and Oyo state (there are 36 states in total). I was hoping I could find a shop to install one of the classic dynamo-lights I frequently saw on old Chinese bicycles in Benin. For anyone planning and preparing a bicycle trip in Africa, please take note. A strong front light will be of great use. I try whenever possible to avoid riding in the dark, but night comes so quickly that it inevitably happens. Yes I have a Petzl headlight, but its beam is not strong enough to pick out the cavernous pot-holes waiting to buckle a wheel and throw a cyclist into the bush. So what other observations does a first time visitor note about the country and its people? One is that Nigerians like to hiss to attract your attention, although their brand of hissing is different from other Africans. They do not “hissss” or “sissss” as such, but pucker their lips as if to kiss, then withdraw air inwards. I suppose it is a bit like a reverse whistle, and needless to say highly irritating. Until you turn to acknowledge the menace doing it, the pitch will increase, possibly culminating in a shout of “Oyibo.” (Yoruba for white man). The shout may come without the hiss, and should you turn to make eye contact there will often be a hand motioning you to stop. The truth is that if I stopped every time someone hissed or yelled “Oyibo” it would take a long time to get anywhere in Nigeria. And I would quickly lose count of the “Do you have something for me”? question whenever I did. Most of the time it’s easier, wiser and generally just safer to smile, wave and pedal on. Which is what I did when the traffic suddenly became unpleasantly congested and the market stalls and people spilled onto the streets. Had I been invisible I would have loved to stop, watch, photograph or film it. But alone, white, on a bike, with “steal me” written within my hands. I don’t think so. Photographs taken in urban areas in Nigeria are best done quickly, and I have the feeling that people won’t mind their own business even if you’re taking a photo of something entirely disconnected to them. Abeokuta is the first real city I entered. 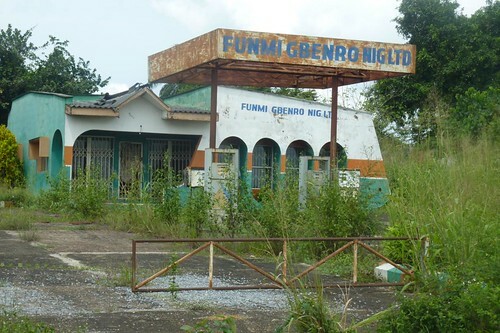 This is the birthplace of several important Nigerians, most notably Fela Kuti, whose music I discovered on my first trip to Africa. These days you sadly won’t hear Afrobeat tunes from the 1970’s played on the streets, but more likely some US-influenced hip-hop and rap. Far less tasteful. Experience, advice and common-sense would dictate that giving $100 to a stranger to go and change money on the black-market is an unwise thing to do, particularly somewhere like Nigeria. Which is what I explained to the owner of the Internet Cafe in Abeokuta, who entrusted his friend with my money to disappear to some part of the city that was allegedly too dangerous for me. “Don’t worry my friend. It is only small money so he won’t steal it”. I thought I ought to explain that this would be my budget for 1-2 weeks, and should it disappear I would have to place my visa card in a Nigerian bank, which would possibly be even less wise. Thankfully this friend returned and asked if I knew what Nigeria’s motto was. “In the words of Fela Kuti, ‘suffering and smiling‘”, I suggested. “No, it is ‘good and great’, and this action has just proved it”. 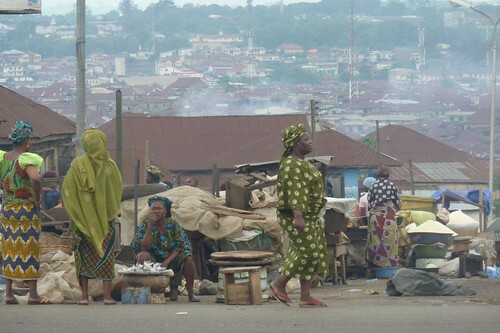 The traffic, crowds, filth and chaos of Abeokuta were but a warm-up for Ibadan, where I arrived the next day. At one time this was West Africa’s largest city, and several people I met there were adamant it still is (in terms of population I think Lagos is). My country map conveniently showed a road that would by-pass it, but I had already realised that the ITM map of Nigeria is about as accurate as that of the one for Ghana. The road took me straight into the centre as there is no other road. When I have more time I will write a letter to ITM and kindly tell them just how terrible their maps of Africa are (Togo and Benin was poor and I have Cameroon still to test). I could easily manage without these maps, but despite their inaccuracies they give a better spatial awareness than the Michellin map of North and West Africa, which seems better updated. At first I thought to just put my head down, ignore the “Hey Igbo” calls and focus on not being hit by one of the thousands of white mini-buses, motorbikes and large cars with Nigerians who somehow give the impression of being aloof or oblivious to the mess they live in. But I realised it would take me hours to pedal beyond the crowds, traffic and tin-roofed skyline, so went about looking for a cheap place to stay before darkness fell. Now the trouble with being a white face in Nigeria, or much of Africa I guess, is that people often assume you need accommodation accustomed to how they imagine you live back home. You are white and therefore rich. So I have to say that 10,000 Naira ($65) is not cheap and that I don’t need air-conditioning and satellite TV, nor to be directed to a hotel where ‘my people stay’. This will be a 4 or 5 star hotel, where people who have jobs and whose company most likely pay for their lodging stay. All I need is security and cleanliness. After a good amount of being directed and mis-directed by various people, most of whose faces read ‘don’t trust me’ (“You can stay with my friend, let me just call him”), I ended up in a brothel. Well a brothel in as much as it was a place that usually rents rooms by the hour. The proprietor seemed nervous, a little confused, yet over-joyed that a white face arriving on a bicycle should want a room in his establishment, so went about making sure I was comfortable. “You people cannot shower with this well water. Look at the colour of it. Let me go and fetch cleaner water. You will need soap as well. I will buy some from the shop. Just make sure you lock your room if you go out. You will be safe here, but bad people come to stay”. Not overly reassuring, but I was taken care of, only leaving the premises to buy rice, beans, fish and plantain from a stall across the street by a woman who seemed equally incredulous that an Igbo was eating her food in an area that few whites probably venture. The traffic finally eased once I cleared the northern outskirts of Ibadan. It was Sunday and the Churches were full. I have lost count of how many different ones exist here. Beyond the Catholic, Methodist, Anglican, Baptist and other major denomination Churches comes a plethora of signs for evangelical/new-age missions, prayer camps and miracle healing events. Some look as shady as the banks, of which there are also a large number. Do I trust my visa card in a Nigerian ATM? I might have to in Abuja. 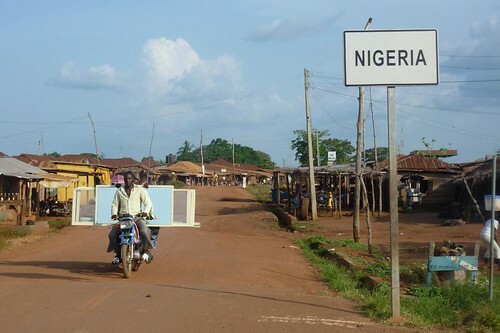 I’m writing this from the town of Oshogbo, where I arrived in a downpour and followed a sign to the first Guest House that didn’t have ‘fully air-conditioned’ or ‘satellite TV’ etc advertised on it. Thankfully its somewhere I’ve felt comfortable enough to relax in for a few days. After surviving the traffic of Ibadan and incessant oyibo calls I feel I need it. Abeokuta looks like a photogenic place from the wikipedia article…it’s a shame that it is so difficult to photograph Nigerian cities. Very impressive indeed. Look forward to reading the details of the rest of your journey. It’s also really refreshing/enlightening to read about Nigeria from a fresh – unbiased – pair of eyes. I think what you meant by “Igbo” in the last few paragraphs was “Oyinbo”. Safe travels. It was a pleasure indeed to read your blog which was brought to my attention from one of your friend. It was a courageous effort after the end of your Asian bicycle round trip to embark upon Africa continent sounds to me incredible. I’m aware that the media does not portray good image about Nigeria. 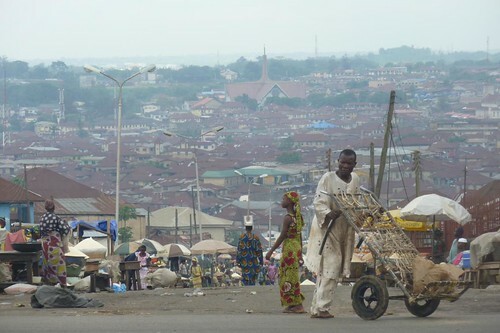 However, Nigeria is not a bad place to visit as the majority of people are charming and welcome individual. Only few unscrupulous elements amongst the country are giving the country bad image. Finally, did you manage to visit OLUMO ROCK during your short stay at Abeokuta? If not have it in mind it is a wonderful place not to miss. Good luck for the rest of your Africa trip. Interesting read! My only regret is that i did not get to read this before we met, i would have had many more questions/ clarifications. What you call hissing is not exactly what we call hissing.The sound you refer to, is a sound to catch a person’s attention(i agree it’s not the nicest of sounds too).I will show you the differnce the next time we speak :-)! On the music, i thinking it’s a general problem with this generation, beats and sounds over content, the focus for most people is how danceable the song is. Yes, I understand your plight on the accommodation issue because people just assume you are rich and feel yourself above the ‘dingies’. Great write-up, brave journey. Will you be going to the South-South states? Very impressive indeed. Look forward to reading the details of the rest of your journey. It’s also really refreshing/enlightening to read about Nigeria from a fresh – unbiased – pair of eyes. I think what you meant by “Igbo” in the last few paragraphs was “Oyinbo”. @lorie, Thanks for contacting. Glad you enjoyed the presentation. You are doing great my man.I hope it will take less than a year to reach Your destination.All your posts have been of great help of giving insights [Previous (crazyguyonabike-A long ride Home) & current expedition]on the places which are almost along my Project route.I Hope we meet someday till then You will be one of my Guiding Souls.Take care and enjoy!!! OK SEE YOU WHEN YOU’RE FINISH BUT REMEMBER I SAID AM GOING TO VIEW ALL DETAIL ABOUT YOUR TOURING, GOD BLESS YOU WISHING YOU GOOD LUCK. Hello Peter i’m one of d guy dt helped you in changing ur money so i think you can see now dt we Nigeria we are GOOD people GREAT nation,pleas wheneva you’re about to finish ur touring just alarm me PRAY dt GOD is with you we’re d Best.